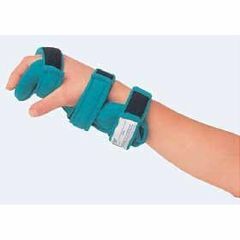 Pedi Comfy Hand/Wrist Splint quick and easy to use for support and progressive extension of the pediatric hand and wrist. The foam-covered metal skeleton bends to fit a wide range of problems. Also great as a resting splint. Ease of use and comfort will increase compliance. Absorbent, washable covers and straps. Fits left or right hand. Is the Pedi Comfy Hand-Wrist Splint for an adult or child ? ?